BBC Countryfile featured the National Hedgelaying Championship on Sunday 18th November prgramme. Still available on the iPlayer. The National Hedgelaying Society is the only charity dedicated to maintaining the traditional skills of hedgelaying and encouraging the sympathetic management of hedgerows for wildlife and landscape. We have no paid staff and rely entirely on members subscriptions and the generosity of sponsors. The Patron of the Society is HRH The Prince of Wales. Hedgelaying is a country craft which has been practised for hundreds of years. The correct management of our hedgerows is essential if we are to conserve our wildlife and landscape for future generations. Hedgerows define our countryside and provide many environmental services, but are also vitally important for wildlife as a refuge, a source of food, and as corridors along which they can move through the landscape. The correct management of hedgerows is therefore vital if they are to survive and be healthy enough to provide a good habitat. Over-management by hard trimming to the same height each year will ultimately degrade the hedge so it is hollow at the base and provide little shelter for wildlife. At the other extreme neglecting a hedge will allow it to become tall and overgrown, eventually even to collapse. Sympathetic management allows blossom and berries to form, allows the hedge to slowly and incrementally increase in size and keeps the hedge in a healthy condition. Eventually though every hedge needs to be rejuvenated from the base and hedgelaying is one of the best and most traditional ways of doing this. 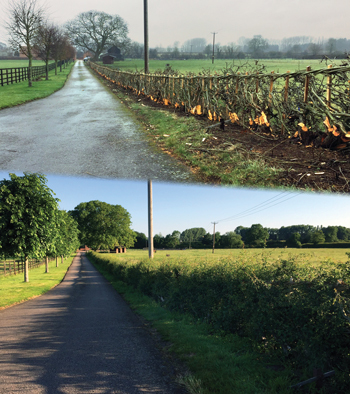 A laid hedge provides a stock proof barrier and a dense habitat for wildlife but most importantly it encourages new growth that starts a new life cycle of the hedge. Hedgelaying preserves the past and protects the future. Hedgelaying declined after the 1939-1945 war due to many factors such as the availability of labour, the introduction of machines to cut hedges, wire fences and changes in agriculture that placed emphasis on production. By the 1960s hedges were declining at an alarming rate. Lack of maintenance meant that hedges became tall and gappy with sparse growth at the base; in effect a line of trees. Many hedges were grubbed out to make larger fields that could be more efficiently managed by larger machinery. 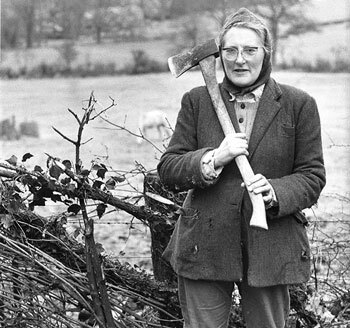 In 1978 three hedge layers – Mr Fred Whitefoot, Mr Clive Matthew, and the late Miss Valerie Greaves (pictured right) realised that soon the valuable skills of hedgerow management that had been acquired over hundreds of years would be lost forever. These founder members conceived the idea of setting up a national society to enable the skill of hedge laying to be documented, and passed on to others. Competitions were organised all over the country. A national competition is now held every year. The Society has members who are drawn from all walks of life, professional and part time hedgelayers and others wishing to support the aims of the Society. 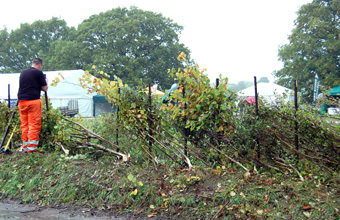 The main aims of the Society are to promote a greater understanding and knowledge about the traditional craft of hedgelaying, encourage the development of hedgerow management skills through training and competitions and encourage the conservations and positive management of hedgerows. The NHLS operates a nationally accredited craftsman certification scheme and organises the National Championship each year. 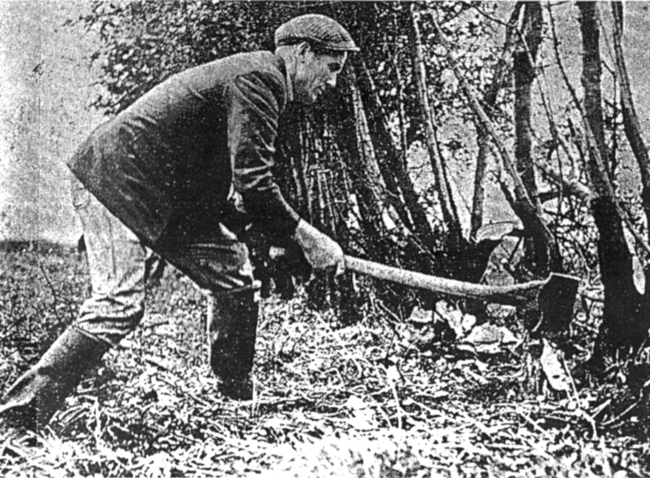 Bert Clark (1925–2007), thought by many to be the finest hedgelayer of his generation, using a 7lb (3.2kg) axe in the days before chainsaw use was commonplace. The National Hedgelaying Society is registered as a Charity and governed in accordance with Charity Commission guidelines and the societies constitution. NHLS are partners in Hedgelink which is a partnership that brings everyone interested in hedgerows together, to share knowledge and ideas, to encourage and inspire, and to work with farmers and other land managers to conserve and enhance our hedgerow heritage.